Henry Cook joined the Royal Navy in 1839 at the age of 15 against the wishes of his father, a prosperous trader in Portsmouth. As a boy sailor he was serving on HMS Rodney in the Autumn of 1840, en route from Gibraltar when the western Mediterranean was swept by one of the worst gales in living memory. HMS Rodney ran into it and the force of the gale nearly turned the ship over. Henry prayed, and made a promise to God that if the ship and her crew were spared he would devote the rest of his life to spreading the Gospel among seafarers. HMS Rodney survived and shortly afterwards Henry left the Navy. He settled in Gosport doing odd jobs, and at the age of 30 he set up a business as a painter and decorator. His premises were in the High Street in the poorest part of the town. Moved by the plight of the children, he soon recruited the nucleus of a Sunday School. The children would gather in his paint store, along with some of their parents, to attend prayer meetings. 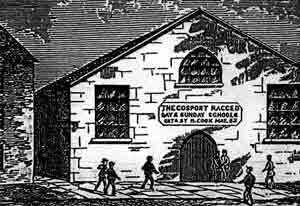 obtained, and the Gosport Ragged Day and Sunday School building was erected in 1853 under the patronage of Lord and Lady Cholmondeley. Mr. O. Upfield the draper. Sunday mornings at 10.30am a service for sailors and watermen and others with their families. Another religious service for the children in the evening, with as many of their parents as can attend. An evening school for poor boys on Monday, Tuesday and Thursday at 7pm. It had to be an evening school as most of the boys would be helping at home, or trying to earn a copper or two during the day. his business and formed the Portsmouth and Gosport Seamen's Mission. After much fund raising (The Thorngate charity settled the sum of £1,200 on trust for the school producing an annual £30 for the school.) 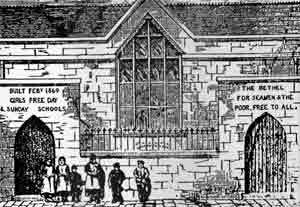 the Bethel Mission and Ragged School for Girls was opened in South Street in February 1869. In addition Henry took on an office and reading room in Stoke Road where a Thai restaurant is now. f you look at it's upper storey, it retains much of it's original appearance. 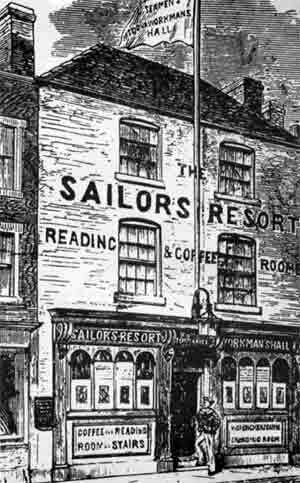 He also set up a coffee and reading rooms in Beach Street. Next he decided to turn his mission to the water and bought an old lug-sailed wherry, freshly retired from service as the Portsea to Portchester Ferry, and manned it with eight of his schoolboys. He ventured further afield spreading his message around the coast until the wherry foundered on rocks in Cornwall during a storm. Undaunted, Henry bought another boat which he named "Annie" and soon his work among seamen was recognised all along the South Coast, from Folkestone to Penzance. Jim Morrison (of the 60's rock group The Doors) was the first rock star to be arrested on stage. Sheryl Crow's front two teeth are fake -- she had them knocked out when she tripped on the stage earlier in her career.